It’s hard to believe that Season 3 of Downton Abbey has come to an end so this is our finale post for Books Like Downton Abbey. And oh my, what did you think of the finale? Welcome to Week 7 of our If You Like Downton Abbey Series. If you are just starting our series, here is Week 1, here is Week 2, here is Week 3, here is Week 4, here is Week 5 and here is Week 6. 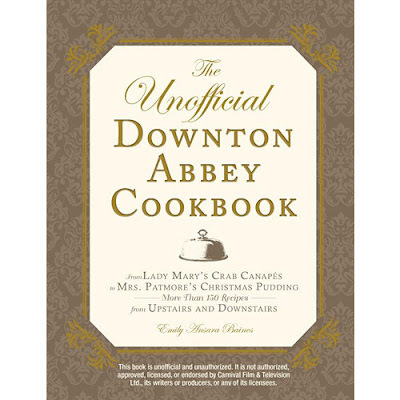 And our Downton Abbey Greatness Pinterest board is here. This book is fabulous. Part 1 is titled, “Dining with the Crawleys.”Part 2 is titled, “Sustenance for the Staff.” How can you not love this book! FW Media provided a review copy of this book. All opinions are my own. My opinion is that it is wonderful! I read this book in one sitting. It is simply riveting! Hyperion Books provided a review copy of this book. All opinions are my own. Wendy Wax is one of my favorite authors so I was delighted to learn of her new novel. It comes on out April 2, 2013 and I strongly encourage you to pre-order! This book has everything that Wax does so well- amazing character development, humor and shows the depth of female friendships. Again, Wax has knocked it out of the park. And, I must say that Edward the concierge is so like Carson in Downton Abbey. Penguin Books provided a review copy of this book. All opinions and gushing are my own. Along with the end of Downton now you are pulling this out from underneath me? It is more then I can bear. Ohhhh another list Cookbook not for me but I still look at it longingly every time I see it. THE HOUSE OF VELVET AND GLASS I enjoyed last year when it came out. But the upcoming Wendy Was novel has my attention. Why didn’t I think of that? Of that’s right I am not a writer. Thank you for your posts throughout the season. Have you heard about The Last Summer by Judith Kinghorn, recently released in United States? It is a fabulous country house-based story!